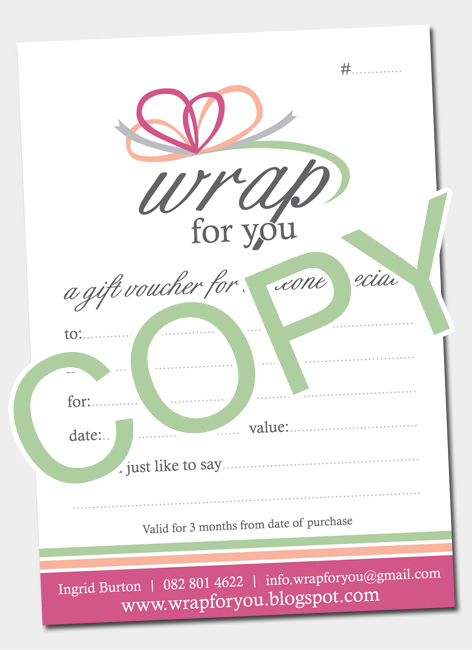 Wrap for You: Gift Vouchers...just in time for Christmas! Gift Vouchers...just in time for Christmas! Just in time for Christmas and to solve your Christmas gifting woes, Wrap for You is now offering Gift Vouchers! You could want to give that special person a voucher toward ribbons and wrap or you could want to give them the gift of a new skill and buy them a space on a Wrap for You Gift Wrapping Course. These gift vouchers make wonderful staff Christmas presents or teachers gifts as courses are run on Saturdays and don't interfere with the work week. Inbox me on info.wrapforyou@gmail.com to order your Gift Voucher or swing past the next I Heart Market on the 3rd November to collect one personally!